You’re a solopreneur trying to make a big splash in the online world. You want great branding that clarifies your message, attracts the right people, and grows your business. And, you need a robust marketing machine to make it all work, and bring in the biz. Well, what if I told you this was all about implementing a 1-2-3 branding and marketing mix? You’d probably say, Craig, that’s super-duper awesome and I want to get going, pronto! Well, read on, dear friend. This magic mix of strategies will bring you a list of innumerable benefits. – Improve your search engine ranking (Google will love you). – Bring the brand cohesiveness you need. – Build awareness around your brand. – Help you reach the right people. – And grow your biz. 2. Have a rock-solid social media engagement strategy. 3. Become a better storyteller. And this trifecta has the power to help you build a marketing machine of your own. A platform that clearly shows what you do and speaks to your ideal customer (Number 1–great content). Your spokes in the form of numerous touchpoints (Number 2–social media done right). And a narrative that helps you produce a continual content stream that helps your audience (Number 3–story. story. story). 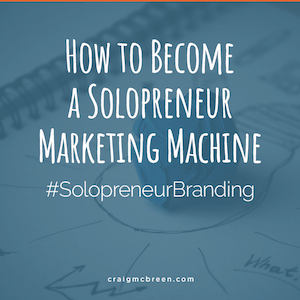 So, once again, how do you become a solopreneur Marketing Machine? The little “brand world” I mentioned. That’s your marketing machine. The thing that I called a “living and breathing” property is your website. What about the social media touchpoints? Work to create a consistent, relevant, and trusted brand. The story? That is you, your business, and the story you tell. It’s a core way to build an unmistakable brand. – Craft the best experience for your customers. – Create and amplify a constant stream of content that brings value. – And to build a marketing machine that grows and helps grow your business, baby! Ask questions – Talk to past customers, current customers, associates. Ask them what they like about you and your business. Why they hired you and stay with you. What makes you unique. Dig and discover the most important questions, and go from there. You’ll quickly have a ton of topics. These topics become titles for blog articles, site copy, creative for online ads, etc. If you want to dive a little deeper, read this post: Want to Tell Your Story and Bring in Customers? (Follow These 3 Rules).